Autumn has started to creep in with our first decent rain in 51 days and a huge cool change by 15°. I’m thankful I finished my beanie as it’s super warm and soft. It’s not my normal colours but every girl needs a change. I’m thinking leg warmers next as I live in stocking during winter and it would be nice not to freeze as much as last year. Think weekend I’m planing on knitting the free beanie pattern from Australian Country Spinners using the Superfine Merino I bought in Melbourne. I thought I better make a super warm hat as I’m still sporting a pixie hair cut. This weekend just gone I spent in Melbourne. Main reason was for a specialist doctor appointment the bonus was shopping! Australian Country Spinners have released a beauty new range called Superfine Merino and only a few shops are stocking it. One of which is Clegs in Melbourne so I bought 3 balls to make a beanie with. 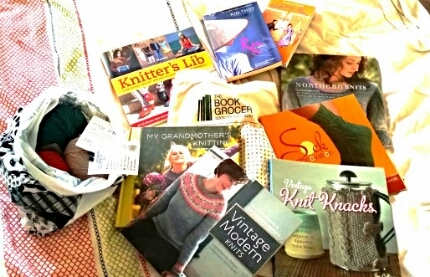 Also I found a massive amount of books at the Book Grocer. I also found this great café across from where my doctor’s appointment was. It’s called Cafeecco. The staff were amazing helpful and the coffee and food was divine. They have gluten free too. I finished my owl jumper that is published by Kate Davies. 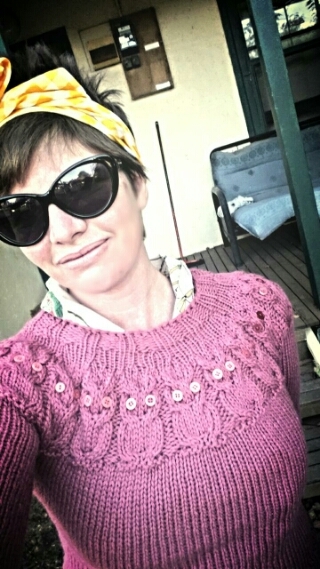 I knitted in Bendigo Wool. It’s so warm! Just in time for my trip to Melbourne. I’m packing a few warm things as we’ve had a cool change hit us and I’m no good with cold weather. I love it but I ache. I’m also knitting socks again with a free pattern on raverly that I’m omitting the heart design in favour of a basic rib. Hopefully that will keep me occupied for the 7 hour train trip.